Cannock Town Centre is supporting Small Business Saturday by hosting in Cannock Shopping Centre a FREE local craft and artisan market on Saturday 1 December, with 30 plus stalls. Stalls have been offered to local people to support creative and budding entrepreneurs to showcase their talents and products for Christmas shoppers. This arts and craft market will complement the normal Saturday street market and will be open for business from 10am until 4pm. Small Business Saturday UK is in its fifth year. It is a grass-roots campaign which aims to support, promote and inspire small businesses. It also encourages consumers to shop local and support independent traders in our town centres. The day always takes place on the first Saturday in December every year, but it is hoped that the campaign will have a lasting impact for small businesses. The local craft and artisan market will host a variety of stalls including leather goods, handbags, wooden planters, wood turned bowls, jewellery, art work, up-cycled furniture, chocolates, cakes, glass decorations, balloons, cards, hair accessories and lots more. Councillor Diane Todd, Town Centre Regeneration Portfolio Leader said: “The craft and artisan market aims to help us to be one of our largest street markets held in Cannock and hopes to attract all those Christmas shoppers looking for something special for Christmas. “I am delighted that so many local people have taken up the offer of the free stalls. I hope that our local residents will support this event and come along to see what’s on offer. “We must remember town centre businesses can’t succeed without the support of shoppers. Small Business Saturday originated in the US in 2010 by American Express and first started in the UK in 2013. 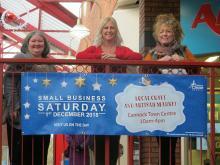 Photograph shows Councillor Diane Todd (left) promoting Small Business Saturday, along with Gill Woodward, Centre Administrator from Cannock Shopping Centre (centre), and Angela Haynes, the Council’s Town Centre Partnership Officer (right).